This is our most anticipated time of the year. On all coastal rivers you will find dwindling crowds and a influx of fresh wild fish. The next several weeks offer the best winter steelheading opportunities of the season. Look for river levels to rise and fall in the near future, with NOAA projecting a significant amount of much needed rain. 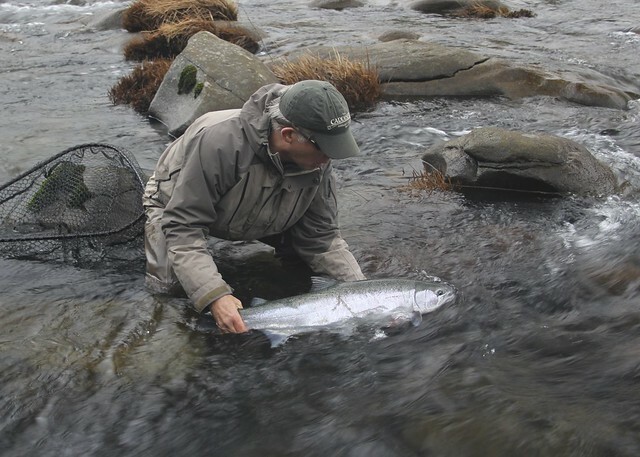 Guests on our most recent trips have experienced great fishing, with a mixed bag of large wild specimens as well as hatchery fish available for harvest. Our winter steelhead trips have increased dramatically in popularity over the past few seasons, and we are very grateful. 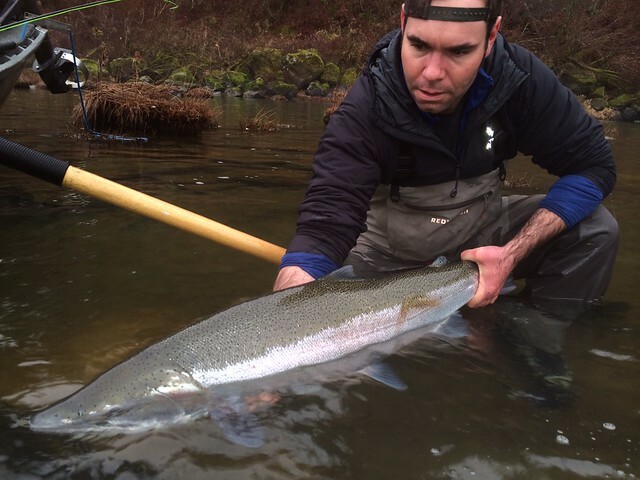 We truly believe that the systems within a days drive of Eugene offer potential for world class winter steelhead fishing. 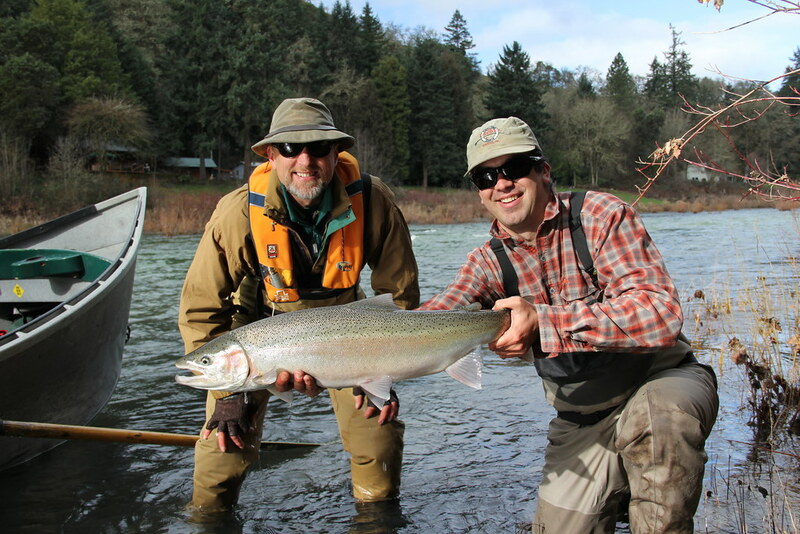 If interested in a winter steelhead trip, call the shop at 541 342 7005. 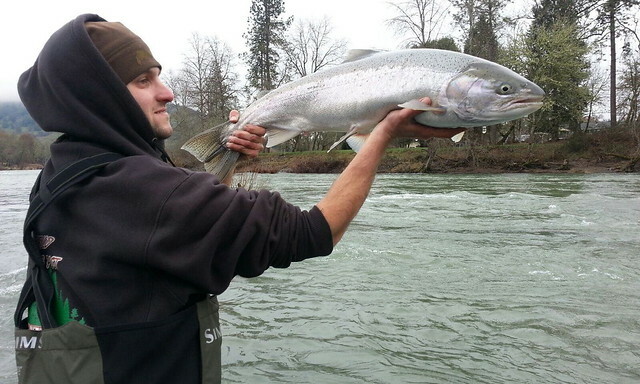 This entry was posted in Coastal Steelhead Fishing, Oregon Winter Steelhead Fishing. Bookmark the permalink. Wow. I need to know how big that top fish is. Glad to see you recognize the importance of catching both Hatchery and Native fish. This allows your customers to release and protect the naturals while letting customers also enjoy some great table fare! The best of both worlds and a program that will protect the guiding business for many years to come. Some people are too polarized to appreciate the vale of compromise. The top fish taped out at 40″ by 20″.